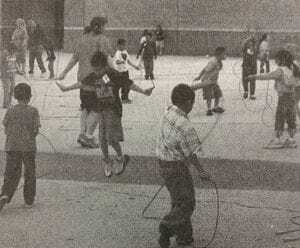 Pleasanton Primary students raise money for the American Heart Association. Pleasanton pitcher Samuel Ramon hurls a pitch late in the sixth inning on Saturday in Poteet. Ramon allowed one hit in 4-1/3 innings pitched against the Aggies to win first place. 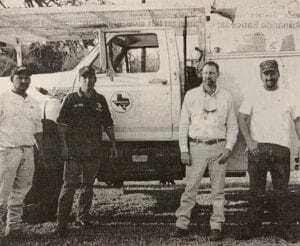 Members of Karnes Electric Co-Op and Pool Electric are shown here after they combined forces to install new light bulbs at the Lions Club Little League Field in Pleasanton. The two companies did the work free of charge. Left to right are James Navarro of Pool Electric, Gabino Gonzales who is the safety officer for the Pleasanton Little League, Doug Pool who owns Pool Electric and Sam Sotello of Karnes Electric. Others who helped in the operation were Robert Lopez of Karnes Electric and Randy Grantham of Pool Electric. 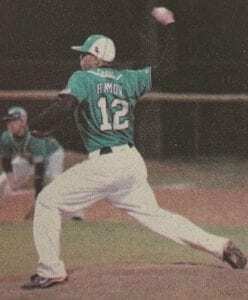 Although Ralph Casias is small in stature, he is one of the spunkiest of the Pleasanton Baseball Eagles and when he’s not pitching, he starts in the infield. 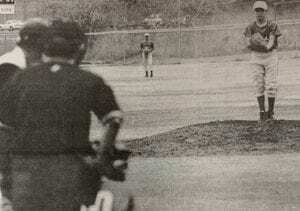 Here he prepares to make a pitch against an Austin Lanier batter during the Poteet Aggies Baseball Tournament. Casias was chosen to the all-tournament team. 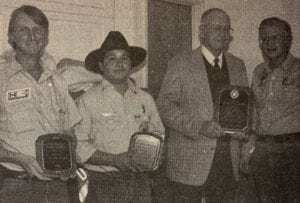 Plaques for special awards were given to, from left, Steve Bennight, Tookie Fireman of the Year; Marcelino Rodriguez, Fireman of the Year; E.W. Wehman Sr., for continued support of the department. Awards were made by Fire Chief Richard Troell, right. Pleasanton Eagle, Billy Martinez, cruises to victory in the 400 meters. 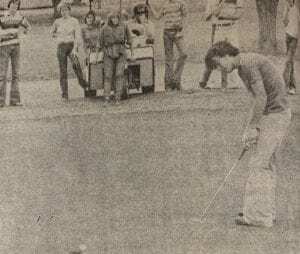 John Freeman of the Pleasanton Eagles had to sink this four-foot putt to win in sudden death over teammate Kevin Farrer in the Eagles’ Invitational Tournament held here this week end. Freeman and Farrer finished in a tie during regulation play and had to go into a sudden death play-off for the medalist trophy. Freeman parred the first hole while Farrer took a bogey. Pleasanton High School Debaters continued to win in recent competition. 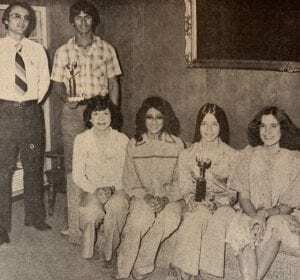 Left to right seated are June Wittler, Debra Rodriguez, Mary Ellen Heinen and sponsor Candice Dasovich. Standing is sponsor John Gehring with Josh Guajardo. 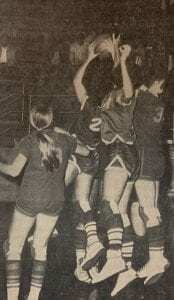 Linda Schorsch and Barbara Oden battle for an offensive rebound against Comfort. 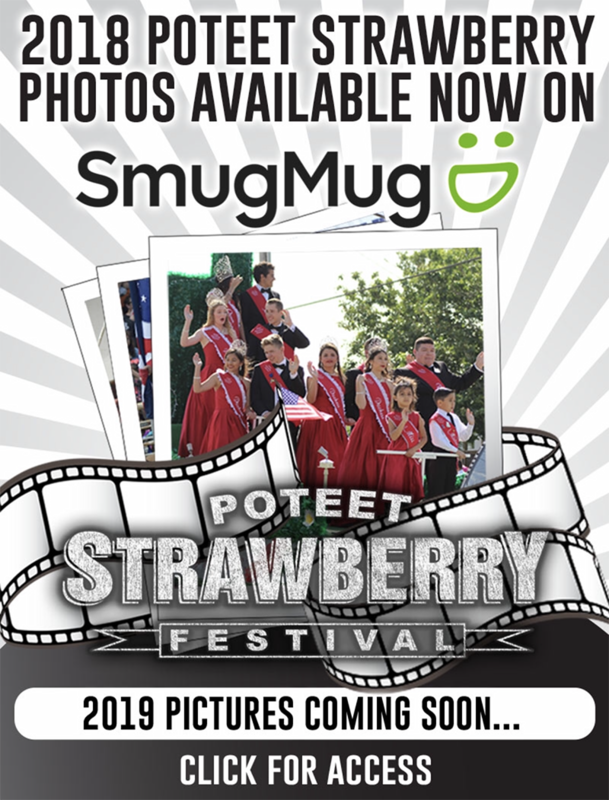 One of these pretty girls will be queen of Poteet’s annual Strawberry Festival next month. 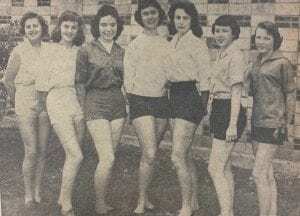 Left to right are Dorothy Andrews, Rebecca Andrews, Sharlot Mifflin, Kathleen Dauwe, Kay Kramer, Dorothy Kenney and JoAnn Collums.